I am so excited about this second Spring blog hop session. Last month was amazing, we had some great inspirations and lots of linkers. I am excited to see what other’s come up with. If you have a blog, link up with it. If you don’t you can still enjoy this link up by getting oodles of great ideas. Click n things and be impressed. 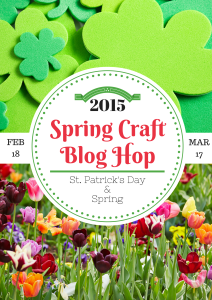 Welcome to the second in a four-part spring craft blog hop challenge for the spring season! This hop will run from February 18 – March 17 and we’re challenging you to create a craft project that reflects St. Patrick’s Day, Palm Sunday, or a General Spring theme. Please join us in this challenge and link-up your crafty creation at the bottom of this post to be seen on 20 blogs! I am sharing on the link up, a fun and simple moss square idea. A new take on the standard moss ball. You can find the full tutorial, another shape option and my witty humor to entertain you here.